FRANCHISE OPPORTUNITIES — Beetle Juice | The original VW cocktail bar - we bring the party to you! A unique business opportunity to join the Beetle Juice family, run your own profitable business and have great fun. Do you like to party ? Are you sociable and outgoing ? Are you bored of mundane jobs ? Do you want to run your own business ? Then consider running a Beetle Juice Cocktail Bar in an exclusive territory. We will be looking for new franchisees to join us now in 2019/2020. The Beetle Juice Cocktail Bars have become a familiar site over the last three years at weddings, parties, events and festivals throughout the UK. To exploit this success and the increased demand we’ve created, we are launching a number of Beetle Juice Cocktail Bar franchises across the UK. You could benefit from the experience we have developed regarding how to run a Beetle Juice Cocktail Bar profitably, whilst having great fun in the process. We are now looking to work with a select number of like-minded people to replicate this success. So if you are a budding entrepreneur, who would like to party whilst making money and you want to share in operating a fabulous and unique Beetle Juice Franchise, then get in touch and find out what it’s all about. 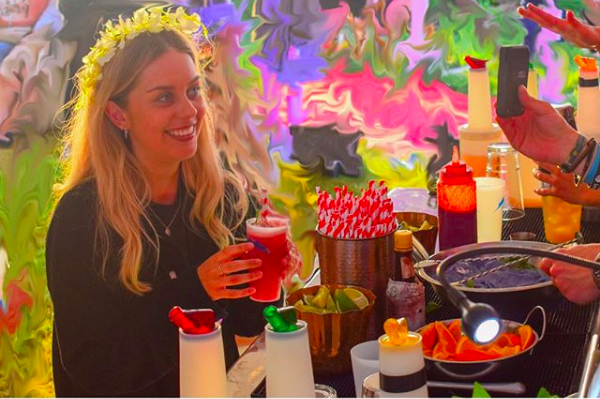 We have learnt the hard way how to make operating the Beetle Juice bars a slick process, which events work and which don’t, and everything you need to know about how to operate a successful Beetle Juice Cocktail Bar business. We would love to share our experience with other people who could enjoy working with a Beetle Juice Cocktail Bar. We have added extra vans, learning along the way how to adapt these iconic vehicles for a new chapter in their lives and with an ever increasing demand for our services, we are looking for people we can work with to exploit the opportunities we have created with Beetle Juice and share in the success, could that be you ? The really good news is that your target market is people who are partying or entertaining and almost everyone loves a party. Cocktails and other higher value drinks are gaining increasing market share as tastes get more sophisticated and Beetle Juice Cocktail Bars are in an ideal position to exploit this growing trend. We have attended a huge range of events with our mobile party vans including all sorts of private parties, weddings, anniversaries, festivals, sporting events, cultural events, club events, school proms, parent balls and university events particularly fresher events and we have described some of these on this website. Equally interesting are corporate events and exhibitions where our clients wish to entertain their staff, clients or potential clients. And the great thing is – most people like a drink when they are partying. Every time a Beetle Juice Cocktail Bar appears, we never fail to raise smiles and get the party started. Beetle juice has created an iconic brand with all the bars being clearly from the same family, but each with its own individual characteristics and colour. Beetle Juice has already generated a lot of interest at local and national level and we are committed to build on this early exposure to keep building Beetle Juice as a recognisable quality brand. To support you, we provide you with marketing materials including Beetle Juice flyers and business cards, black Beetle Juice t shirts and a range of Beetle Juice branded products. You will have the benefit of leads from our website and social media sites. We initially handle any enquiries that come through the website for your territory on your behalf and our central major and national accounts team generate leads for events throughout the country which, where appropriate, we allocate to our franchisees to fulfil. We have an active Facebook and Twitter presence and a growing number of followers and partner companies. We will provide you with help in identifying potential events in your exclusive territory and the sorts of people you need to make contact with to grow your pipeline of events. We will also help you get up and running at your first engagements and help you get established by providing you with preferential status to fulfil our centrally sourced events during your first year. We are happy to train people on serving cocktails and offer a Beetle Juice Bar accreditation to those that have attended on the job training at an event. We are building up a list of experienced people who can help you to run a bar if you have multiple events on one day or just need extra hands. Driving a Beetle Juice Cocktail Bar is a little different from most peoples driving experience to date. We will help you with getting used to the idiosyncrasies of being a Vee Dub jockey but the good news is that you are unlikely to pick up too many speeding tickets ! Each franchise will be slightly different in its mix of events, depending on your specific geography and the personal preferences for the events you target. Typically there will be a mix of private events such as birthdays, anniversary parties, weddings, school or university social events etc. which might be operated on a fixed price dry hire basis or on a cost per person or on a cash bar basis. Public events such as festivals, shows, sporting events etc. may involve a fee for attendance or a commission on drink sales and are usually repeatable annual events. We can help you to evaluate which events are likely to be most attractive to attend. At a busy event it is quite possible to take well over £3,000 per day and many larger events now take place over a number of days. We can get you up and running quickly with a low Franchise entry fee. In many areas we already have events that we will pass over to an area Franchisee. In your first year of operation we offer a very reduced franchise fee with a low cost shared revenue model and preferred status for some of our centrally managed events. In subsequent years the franchise fee is a fixed cost which allows you to maximise your profits. A Franchisee should be able to quickly get to a point where they can generate a profit of £25,000 - £30,000 from participating at around 50 events per year. The Franchise is ideal for a couple or two friends and can be combined with other jobs either connected with Beetle Juice such as event or venue management or separate activities. Our preference is to work with ambitious people who would like to operate multiple bars in a geographic region with multiple exclusive franchises. Our figures for the business opportunity are not academic forecasts or spreadsheet estimates but based on what we have achieved in four years of trading. If you find yourself with more than one event on the same day you can either hire an extra bar for a one off occasion (subject to availability) or you can pass the event to another Beetle Juice Franchise and take an appropriate commission. You have exclusive rights to the events in your exclusive territory (apart from any specific events listed as exceptions when you sign your franchise agreement) regardless of where the lead originated. You can also undertake events at other areas outside your territory in areas where no exclusive franchise yet exists (subject to prior agreement of the central sales team). A list of the exclusive territories and excluded events is maintained centrally for Beetle Juice Franchisees. The business is highly cash generative as most sales are in cash at the point of purchase. Given the nature of the business there is virtually no bad debt or credit control required. Whilst there is a much higher number of potential events during the April to October period there are still many opportunities during the winter months and we have been successful for example at Christmas fairs, Halloween & Bonfire night parties, and parties in the growing number of heated marquees and barns that have appeared as venues over the last few years, as well as the accessible indoor venues, exhibitions and corporate events which are year round activities. If you are a keen winter sports person that works a ski season there is an opportunity to combine a Beetle Juice franchise with this activity particularly if you have a support network to help you book into summer events as a lot of the booking activity occurs during the winter and early spring. The Beetle Juice area franchise fee covers the rental of the exclusive territory, rental of a taxed, insured and annually maintained, fully fitted out camper bar and a whole range of marketing logistics and support services. Our sales team also help to deliver some leads for events that we develop through our central marketing services. All of this is designed to help make you a success and give you the incentive to make more money for yourself. If you are really successful with your franchise there are a number of options to expand. The great thing about being a Beetle Juice Franchise owner is the flexibility it gives you and it is your ticket into attending some great events. Most activity when not attending events involves marketing, identifying and networking with event organisers and complementary businesses such as venues, marquee hire companies etc and getting your business profiled in the local community. Before an event you need to ensure you have planned everything you need for attendance, including enough ingredients for the cocktails and a replenishment plan if you sell out. At the event itself, we insist that you are in attendance at least 2 hours before the event commences. It is good if there are two or three of you present to run the bar which can get very busy at times and the more sociable you are with the customers the more they stay around the bar and create that important party atmosphere. We have lots of techniques to help you increase sales at events which we will share with you during your training. In some territories such as tourist / coastal areas, it may be possible to operate the bar on a semi-permanent location basis (subject to local licensing conditions and permissions). You will need to keep the VW bar clean and tidy and check all the usual day to day maintenance issues, oil, tyre pressures, enough fuel ! We don’t expect you to be a mechanic but our lady vans are typically 35-45 years old so you do need to treat them with care and respect. We do take the van back once a year to undertake a full service, MOT and any repairs necessary or refurbishment from fair wear and tear. You could easily combine operating a Beetle Juice Cocktail Bar with other activities and it is always good to have a support network of trusted friends or relations to help you. We have never been short of willing volunteers to work at events behind the bar.